Besides fragrant flowers and beautiful warm weather, the beginning of the spring season usually comes with viruses which may infect our babies with colds, flu, bronchitis, pharyngitis and other similar respiratory infections. Probably as many other babies, our 9mo daughter caught herself a respiratory virus which gave her a mild, but long-drawn bronchiolitis. It was for the above reason that I decided to write a few words about this subject. I also plan to make a review about the nebulizer apparatus which helped us a lot during our baby girl’s respiratory infection. The nebulizer is a machine used to treat various breathing conditions (a wide range of respiratory tract disorders, extending from the upper airway to the pulmonary vasculature, from common respiratory infections and illnesses to asthma). The apparatus converts liquid medication into aerosols (a fine mist) that are inhaled through a mask, mouthpiece or nosepiece. 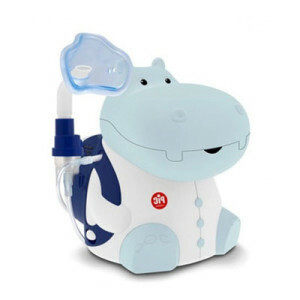 Nebulizers, also called Compressor Nebulizer Systems usually include the following components: air compressor, compressor tubing, mask or mouthpiece, medication, nebulizer cup. They come in various sizes, the smaller ones (pediatric nebulizers) being great for kids because of their very fast treatment timings. Portable nebulizers are easy to use outdoors or when you are in a hurry. Nebulizer machines, are often used to administer medication to infants, toddler and young children although the procedure could be frightening for them in the beginning. A nebulizer treatment tends to be really effective in delivering aerosolized medications deep into the respiratory tract. It takes 5 to 10 minutes to complete a standard nebulizer process (for infants), depending on the medication prescribed by your physician. The treatment can be used safely at home. How to use a pediatric nebulizer on your baby? At first, using a nebulizer might be a scary thing for an infant. So, here are a few steps to help you safely nebulize your baby. First of all, make sure you washed your hands thoroughly before you handle the machine, you added the right dose of prescription medicine to the nebulizer cup and you connected the parts of the nebulizer correctly. Most nebulizers are easy to set up, just follow the manufacturer’s instruction manual. Always clean and sterilize the apparatus’ components before you use it, otherwise it increases the risk of respiratory infection like pneumonia. Try to relax your infant. Show him the machine, explain to him how it works and let him watch the nebulizer preparation, so he can feel part of the procedure. Try to transform the process into a relaxing game. Gently, put the mask of the nebulizer compressor on your infant’s nose and mouth while making sure it fits comfortably and your baby remains calm. Supervise your infant as he inhales the complete dose of medicine. Also, make sure your baby breaths normally during the process. If your baby becomes agitated, pause the treatment and resume it when he relaxes. You can also use one of the other accessories, the mouthpiece or the nosepiece, but they are not always very well accepted by the smaller children because they usually have problems holding them. It is not recommended to use the same accessories on different persons, so buy each family member who uses the machine his own set of nebulizer accessories. In conclusion, infant nebulization is a great option for your infant if it has respiratory problems. It helps your baby loosen the mucus in his lungs and cough it up more easily. It also relaxes the airway muscles so that more air can move in and out of the lungs making breathing easier. Have you ever used an infant nebulizer on your baby? How was the process and what were the results? I had a grandmother with severe asthma. She used a nebulizer to treat her condition. However, I never thought about how it might be difficult to use a nebulizer to aerosolize a prescription inhalation medication. Thanks for your tips on how to use a nebulizer with children. Since asthma runs in my family, I might need to know how to use them on my future children. Thanks.